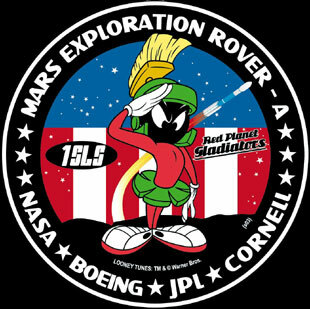 collectSPACE - news - "Looney Tunes star on NASA patches"
June 3, 2003 — Marvin The Martian and Daffy Duck (as the fearless Duck Dodgers) will be showcased on official 1st Space Launch Squadron patches for two NASA Mars Exploration Rover Missions this summer. The special patches will act as the defining logo and will be worn by TEAM DELTA crews, comprising members from NASA, the United States Air Force, and Boeing. Additionally, they will be found in the mission control booth and at the Air Force 1SLS launch pad, and will be carried on mission control and launch pad crew suits, jackets, and mugs. The Delta rockets will send the Mission Exploration Rover (MER) on special research operations to study the Red Planet, which the delightfully droll Marvin calls home. "Daffy Duck and Marvin The Martian struck us as such a perfect fit, capturing the fun and adventurous spirit of these important explorations, that we were delighted to be able to include them as honorary members of the team," said Captain David Krambeck of TEAM DELTA. "Well said," added Daffy Duck, who plays courageously cowardly Duck Dodgers on Cartoon Network's new original series from Warner Bros., debuting this summer. "And check out the spiffy outfits." 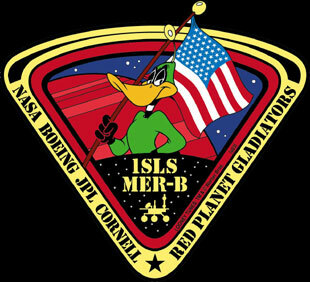 Representatives from the Air Force working with Warner Bros. Consumer Products created the official patch designs for both the Mars-A and Mars-B missions, one patch featuring Marvin The Martian saluting the Mars Rover and the other, Daffy Duck as Duck Dodgers posed proudly with the American flag. The first launch is scheduled for June 8th, and the second launch will be slated for June 25th. "It is exciting that our characters, which for so many years have been associated with space adventures in the animated world, should now have a chance to become part of a real and important space exploration," said Jordan Sollitto, Executive Vice President of Worldwide Marketing, Warner Bros. Consumer Products. "We are thrilled about teaming up with NASA on these exciting missions and are looking forward to giving our characters the opportunity to touch down upon the Red Planet." "More accurately, the planet is an understated fiery umber," Marvin interjected.